25inches no scale prolly 10 wouldn't ya say?? Ours was four ounces less nice catch Bob! Haha that looks about right is that a Cayuga fish?? You put him on the wall?? suttontroller94, that's a real beauty. nice going. Thanks it was in the final hour of our flta tourney this weekend was getting down to wire so we broke out the desperate measures and it paid off! 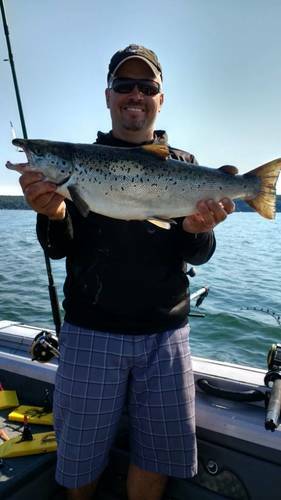 Currently holding big landlock for the year after beating John's (nautitroller) beautiful fish out by a small margin of 4 oz. Only 3 lakes left to go with only 1 of those containing landlocks. Hopefully that fish will earn us a plaque! I'm sure it will! Great catch Bob! 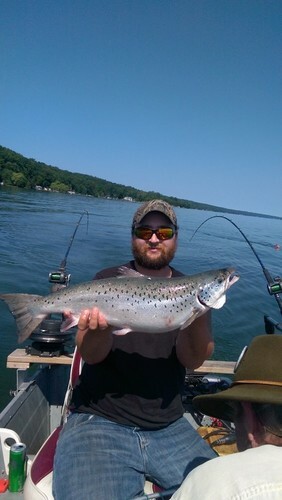 Cayuga is producing some epic fish lately! Those Atlantics are beautiful and good eating as well when kept. Nice work!